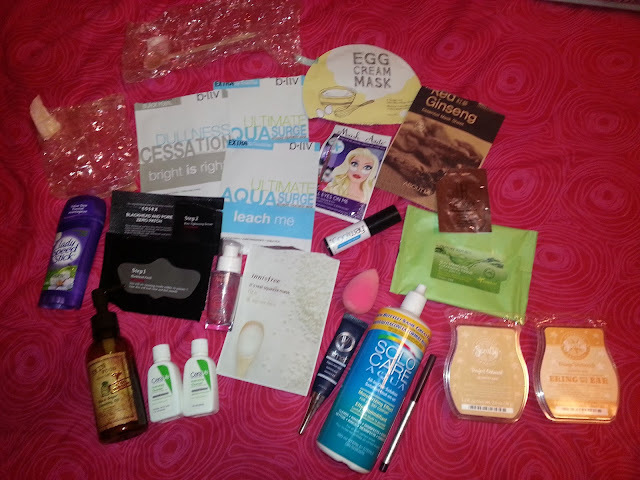 I looooove empties! I probably say this every month, but it really is one of my favourite things to blog about. I love seeing what I've used up, what others have used up, and if you guys would repurchase your empties. Sometimes us makeup/skincare enthusiasts (yes, I'm going to use enthusiast because it sounds much better) rack up a ton of products, and some get hidden or forgotten about. Empties make me feel like I'm actually finishing things! I used a few more masks then I did in April, so that makes me happy... but we'll take a better look at everything! My Mom actually gave these to me when she was visiting from the US. Maybe we have them here in Canada, I'm not sure... I've never actually looked to be honest. I loved how creamy these cleansers were. 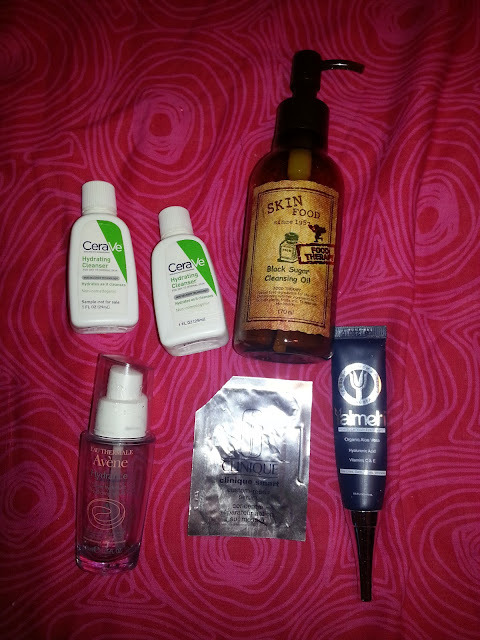 They did an okay job at removing makeup, but that's because I usually use an oil cleanser first. I'd consider repurchasing these in the future if we have them in Canada and are an affordable price. They didn't strip my skin, or make it feel dry. First off, I have to say I'm not a fan of this scent. It reminds me of lemon cleansers for your home. I imagined it smelling a little more sweet, like brown sugar. It did an okay job at removing my makeup, but it was never consistent. Some days it got everything, other days it didn't. And I pretty much always use the same mascara. That was usually the one thing that it would have difficulty removing. I wouldn't repurchase this just because I really enjoy my Banila Co oil cleanser more. I won this in a giveaway, and at first I didn't think it did much for me. But over time, it really helped my skin feel hydrated. If I didn't use it, my skin would feel so dry. I enjoyed this serum and would consider repurchasing it in the future, if I could get it at a decent price. I think Avene is a little expensive here, but I could be wrong! I have a love hate relationship with foil skin care packets. I love that you can try them out, but I find you never really get enough product to find out if your skin would enjoy it over time. So based on that fact, I can't really say if I would purchase this. I got this a while ago for reviewing purposes. When I use it on a consistent basis then I can see some of my dark circles diminishing, but once you stop, so do the results. I tried to use it again but it started to burn my under eye area, which I took as a sign that it was time to toss it. I wouldn't repurchase this, and I have a ton of other sample size eye creams to use up. This is our all in one contact lens solution that we can both agree on being our favourite lol. It's moisturizing and keeps contacts clean. I've already purchased another bottle. I'm not completely sure where I got this from, but they are supposed to be makeup remover wipes. They did an okay job, but were a little rough. I prefer other brands, so I wouldn't repurchase these in the future. Not a fan of this at all. It made my hair look and feel super dried out. I would not repurchase. This was a nice dark purple shade eyeliner. I used it maybe twice, and then one day I went to use it, and the eyeliner part fell out. So that became useless. I wouldn't repurchase this just because I'm not a fan of eyeliner crayons. I had to say goodbye to my beauty blender. Only because it was old. I think it approached the one year mark and I figured that it was probably time to let it go. 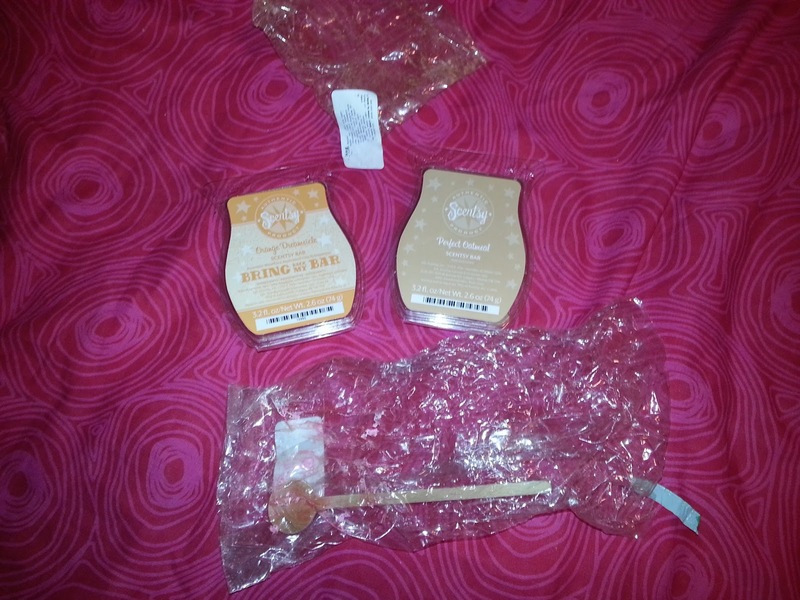 I already repurchased a new one, and I really enjoy how it applies my makeup! Just deodorant. I've already repurchased this. It's my usual brand but I switch up the scents. This bath bomb smelled great, and I had purchased it during the BOGO event on boxing day. It's very moisturizing and I would repurchase this in the future. This is a bring back my bar scent and smelled exactly like an orange creamsicle popsicle. It was sweet, but not something I would typically warm. This is an older scent which I wasn't a big fan of. I wouldn't repurchase this in the future, but it has also been discontinued since. This is a reusable bubble bar, in the shape of a star on a wand. At first I didn't like the wand because I felt it would break easily, but the actual bubble bar stayed on it the whole time. I got a ton of uses out of it, maybe somewhere around 8. I really enjoyed the scent, it smelled like bubble gum. I would definitely repurchase this again next winter! I'm not going to get into too much detail about the masks, just because most of them are repeats. I will say that I really really enjoyed the Egg Cream Mask. It really moisturized my skin and made it look so hydrated, and feel so soft. The Red Ginseng mask smelled like dirt, I couldn't wear it really long because the scent just kept lingering. I didn't notice any difference in my eyes after using the Masker Aide eye gels, and that COSRX Blackhead and Pore Zero Patch stung my skin like no other. Even after removing it and rinsing my face, my nose continued to sting. 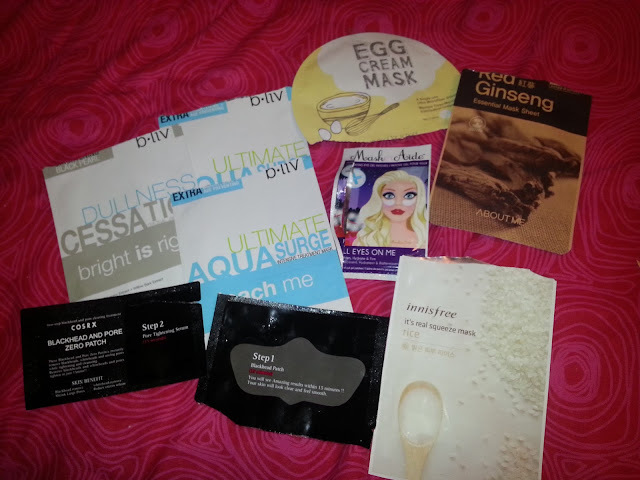 The B-Liv are masks that I have used in previous months and enjoy as well. I would consider repurchasing the Egg Cream Masks in the future. Oh I like the sound of that Avene serum! 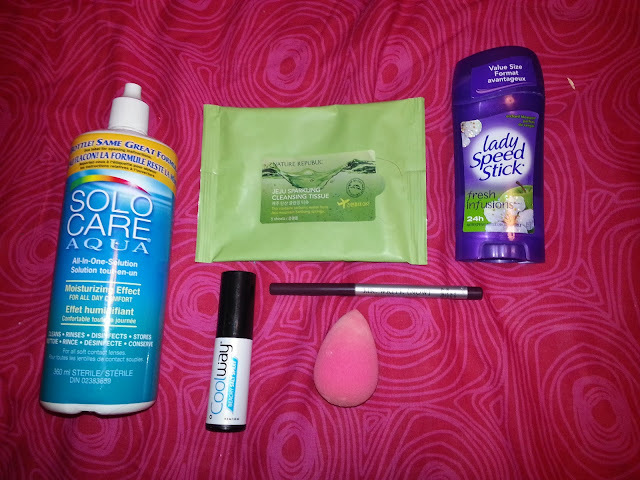 Also, is it worth getting the beauty blender over the RT sponge (my favourite way to apply makeup!)? I've heard there is a huge difference but I can't image that it's worth the money! I haven't tried the RT sponge, but I have heard they are similar! If you like the RT sponge, I wouldn't bother getting the BB to be honest. I love how it applies my makeup, but if theres a more affordable product that does something almost the same, I'd go with that! Now, I must find RT and try it myself!